At their annual membership meeting this past weekend, the Ohio Premium Pine Cooperative (OPPC) re-evaluated their mission and restructured their organization. Following an online survey and discussion within the organization, OPPC has officially change their name to the Ohio Forestry Cooperative (OFC). This moniker change comes as the organization has decided in recent months to expand their original focus (white pine) to include several different types of trees and forests in Ohio. As the OFC, they will continue to offer support and consulting to landowners across the state about stewardship and landcare. AmeriCorps VISTA Susi Rankis, a member of Rural Action's Sustainable Forestry team who has been working closely with OFC for the past few months, said that the meeting was very successful. She also reported that as the organization shifts its focus they will also be working towards becoming certified by the Forestry Stewardship Council (FSC), which, according to Rankis, has some of the "strictest, most environmentally and socially conscious standards" concerning the timber that they work with. In addition to this work with FSC, they are also exploring carbon sequestration models for landowners and forming a business development committee to explore further partnerships with Rural Action. 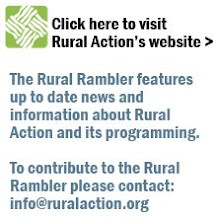 Rural Action would like to congratulate OFC on their new name, and their new direction. We look forward to working with them in the future.